Not long after seeing Jaws n a theatre,my mom & dad brought this exact shark home and it floated in our pool for 2 Summers until Hurricane Belle blew it away.It was obviously generic,but that summer, it was JAWS and it took a bite out of us all! Inflatable Flying Saucer?Did they forsee the future success of Star Wars and Close Encounters?These guys were toy gurus! The only "official" Jaws items I have are 2 movie programs for Jaws 2 and the DVD. 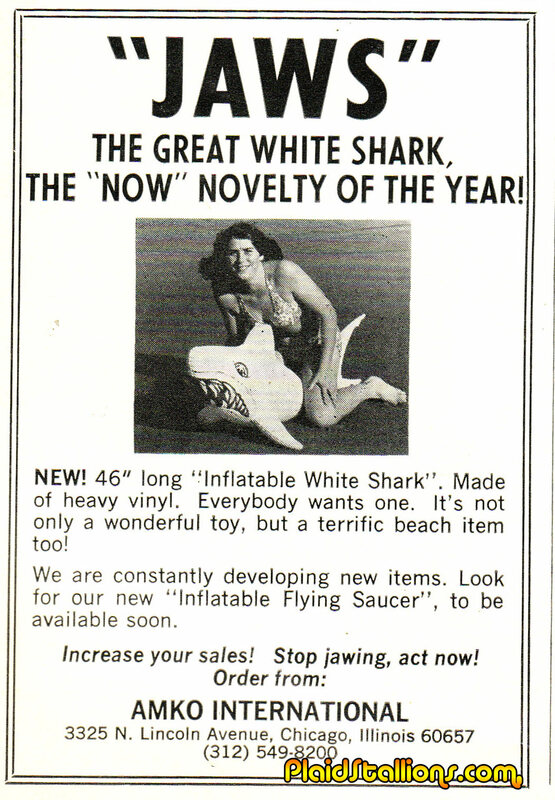 If I had known about that inflatable shark back then, it would have been hanging from my living room ceiling that same day.